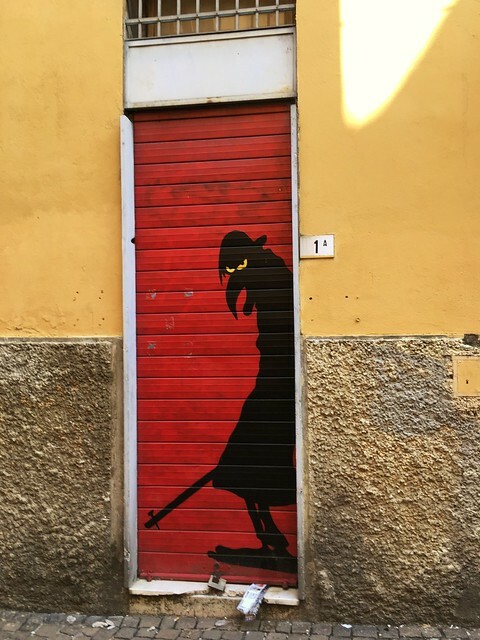 One of my current favorite bits of street art in Bologna. Yes, it’s been months since I blogged. Life hit us hard with a medical issue. It’s ongoing and I don’t really feel like blogging (not my medical issue). You should follow my Instagram account, as I do post there more often. Not a lot of details, but still pretty pictures. I posted this one here, because I thought it was better bigger. Know your enemy! 🙂 I know it’s creepy and awful, but I love it! This city is full of fantastic street art. I posted a dragon recently on Instagram that’s across the street from this one. Someday I’ll get back to more detailed posts. I’m just burned out from work and life. But Bologna is still a beautiful city and bless the Italian healthcare system! Seriously! Don’t complain about socialism if you haven’t had the benefit of their healthcare system! We’d be destitute in the US.